The first ever color fun run to display unity amongst ISPSCians was held as part of the college’s Emerald Jubilee Celebration, March 1. 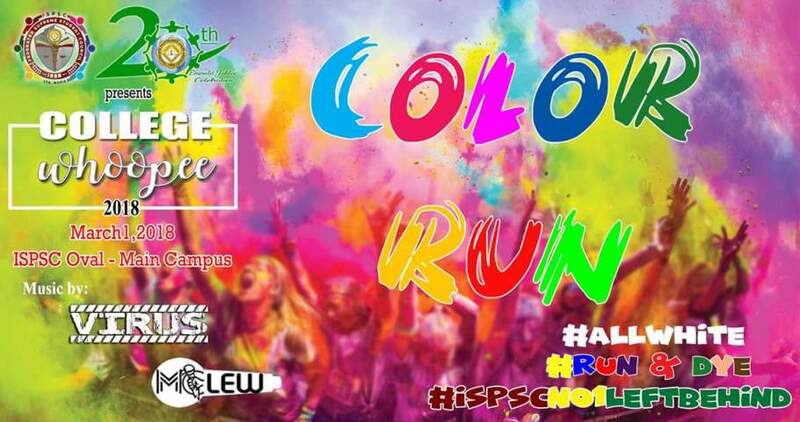 The Color Fun Run was sponsored by the Federated Supreme Student Council (FSSC) and was held at Ilocos Sur Polytechnic State College (ISPSC) sta. maria campus with participants coming from all six campuses. The even started at the ISPSC oval with the participants wearing white shirt. The Bureau in Fire Protection (BFP) assisted the participants by soaking them in water throughout the event. Paramedics of ISPSC supported the event, providing support for participants who need medical attention. Each student marched from the ISPSC oval to Caltex down to Sta. Maria Town Plaza all the way to Brgy. Baliw Laud then back to the ISPSC oval as the Color Fun Run celebration ended with a blast.